The Products developed by SK Intech are approved by Major Industries, Government, and Semi government Sectors due to our cordial customer relationship, and strict quality policies, most of the major clients took reference from our existing customers. This product is approved by FSSAI. 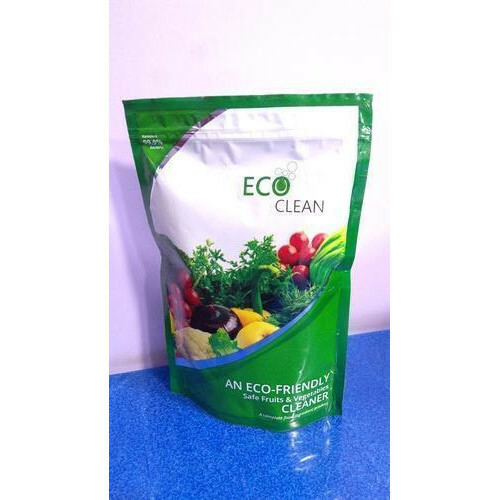 One of the best and safest Food ingredient based cleaner in the Market. Through the formal experiment which shows the chemical impurities get clearly removed. We have tested the pesticide residues removal experiment with grapes, strawberries, peppers, mandarins, tomatoes by Captan, Dichlorvos, Chlorothalonil etc. Packaging Details 30 sachets per box. We, SK Intech Metchems Pvt. Ltd., established in the year 2003 are counted among the prominent Manufacturer, Exporter and Trader of a comprehensive array of Chemical Cleaning Products. Our offered range is inclusive of Rust Preventive, Vapor Degreasers, Rust Remover, Degreasing Chemical, Kitchen Cleaners, Disinfectant Chemicals, Rust and Corrosion Inhibitor, etc. Within a limited period of our existence, we have been able to gain a firm foothold in the industry. Our products are formulated under hygienic conditions, using premium quality materials and sophisticated technology. Owing to their accurate composition, high effectiveness and long shelf life, these products are widely patronized by the customers. While formulating these products, our experts maintain strict adherence to the established industry standards. Since our establishment, we have been focused on the attainment of maximum possible customer satisfaction. We strive to understand the exact requirements of the customers and come up with products that fulfill these requirements in the most cost-effective manner. Also, we are regarded for timely delivery of our products and the flexible payment options provided by us to our customers.